Which EVV Model is Right for Your State? Last week, in the first installment of our series on mandated Electronic Visit Verification, we reported on our conversation with Sandata CEO Tom Underwood about the ways states might choose to comply with the 21st Century CURES Act. 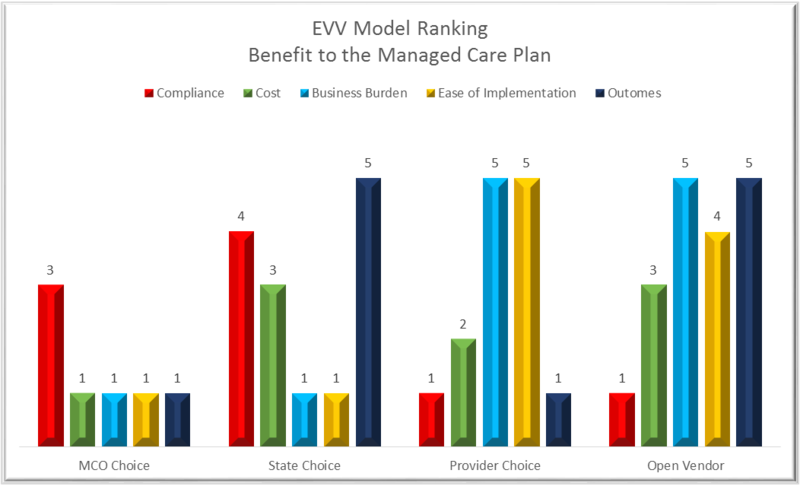 (See "Four EVV Models States Might Choose; Three Lead to Disaster" HCTR, August 16) In part two, we reprint, with his permission, charts that detail his recommended strategy for each stakeholder category: providers, states, and MCOs. Outcomes: How much savings will the state expect to recoup based on impacts to fraud, waste and abuse. 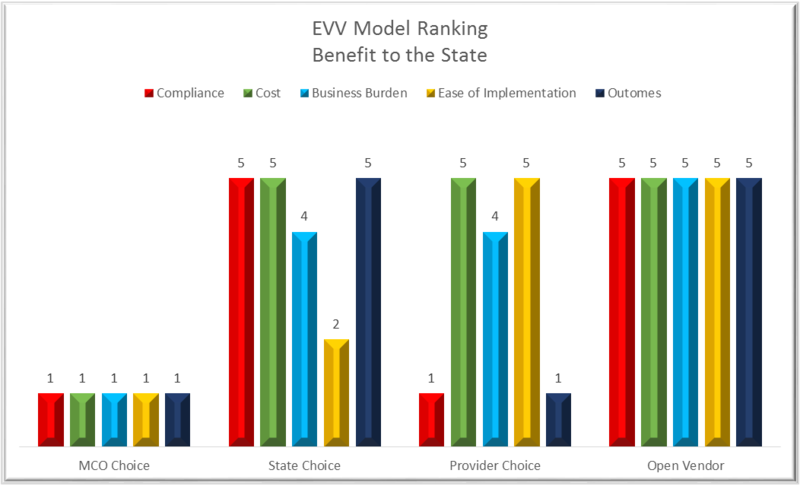 On all five measures, two of the models offer mixed benefits to states, the Open Vendor model scores a perfect row of fives, and the model that allows MCOs to select the EVV vendor of their choice is disastrous for all. According to these scores, allowing MCOs to select different vendors is as harmful to providers as it was shown to be to states in the previous chart. The preferred model, Open Vendor, is not perfect from the provider's perspective. This model shares some costs between the state and the provider and it does not score quite as high on the "ease of implementation" scale as the Provider Choice model does. Nevertheless, overall, it is the model that best supports provider compliance and outcomes while imposing the least burden on the provider's business. Outcomes: How much savings will the MCO expect to recoup based on impacts to fraud, waste and abuse. This is the only stakeholder group that gains even a minor benefit from the MCO Choice model, though not enough to justify implementing it. Conversely, the State Choice model is stronger than the Open Vendor model with regard to compliance support. 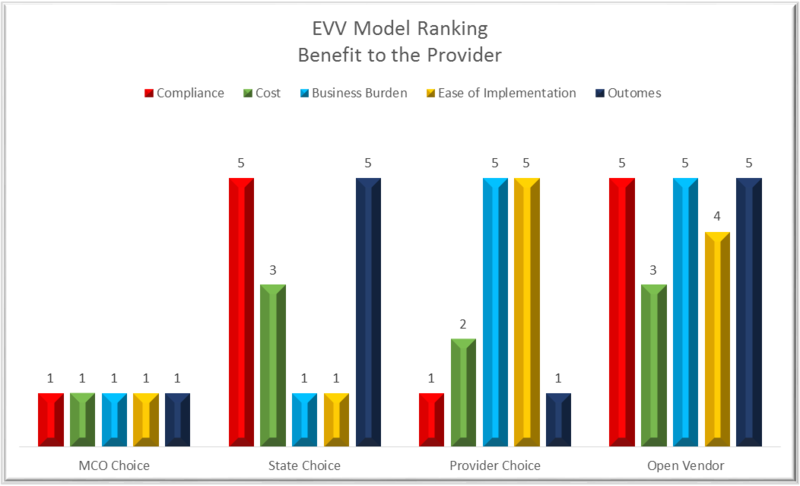 Nevertheless, the State Choice model's extreme business burden and implementation difficulty put it second to the overall preferred model, Open Vendor, provided measures are put in place to bolster compliance in other ways. The Department of Human Services (Department) is soliciting public input on the use of electronic visit verification (EVV) systems for Medicaid-funded personal care and home health care services in Pennsylvania. EVV will be required for personal care and home health care services provided in more than a dozen state Medical Assistance programs. The Department is soliciting input from beneficiaries, family caregivers, provider agencies, and individuals who furnish personal care services or home health care services, managed care organizations, and other stakeholders on the current use of EVV in the commonwealth and the impact of EVV implementation. The Department would like feedback on existing best practices; EVV systems currently in use in Pennsylvania; and preference for a state, state-contracted or provider agency-operated EVV system. To date, Underwood's declaration that the Open Vendor model will be more successful than the others for all stakeholders is largely based on theoretical analysis, but not for long. Florida's Agency for Health Care Administration has accepted the challenge to implement this new model after scrapping its failing first attempt, State Choice. Ohio is also preparing a modified version of Open Vendor but is still in the planning stages. Details: In Florida, the state will bear the costs if providers select a bare bones solution from a state-approved vendor. Providers needing full EVV functionality and efficiency may contract with -- and pay for -- any vendor of their choosing that meets certain state standards, such as data exchange compatibility with the AHCA system. Underwood's recommendations to Florida providers, which will apply to providers in any other state that opts for Open Vendor, are strongly worded. They apply whether a provider has an existing relationship with an EVV vendor or not, or with an EMR vendor that offers its own EVV module. Proven compliance with AHCA EVV requirements at no additional charge. Ability to provide data to/from the state system at no additional charge. Proven ability to work in an Open EVV environment at no additional charge. Proven ability to support state billing requirements at no additional charge. Ability to improve your efficiencies to offset EVV costs and willing to guarantee it. Obtain integration specifications from the state before contacting vendors. Make a thorough evaluation of vendor experience. Make an equally thorough evaluation of vendor qualifications, especially to meet state standards. If you already have a vendor, go through your state's standards with them to obtain assurance they are compatible. In states that have yet to decide which model to use, now is the time to educate them. This series of articles has been written to assist HCTR readers to present a logical, researched argument to state Medicaid officials. With the CURES Act deadline a little more than 15 months away for non-medical home care providers, it is likely discussions have already begun (see sidebar).